The Coptic community of St. John was officially founded in 2007. 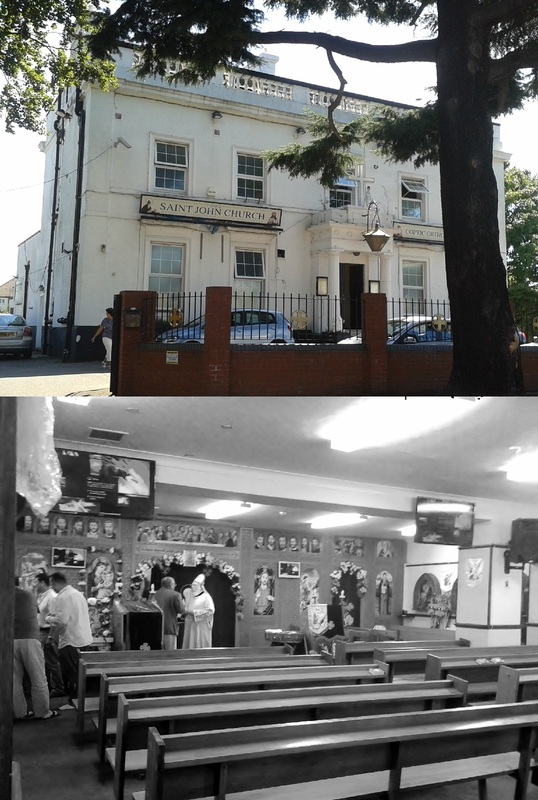 They worship in a building acquired in 2011, which used to be a pub (the Elmer Lodge) built in 1839. The outside of the church is rather unusual for a church, but as mentioned that is not the original function of the building. The interior of the church is richly decorated with icons, many of which are in a very modern, western style (one, of someone who I think is St Anthony, appears to be winking). The iconostasis at the front has two tiers, with a long icon of the last supper above the main doors. A pulpit just in front was used for the readings. A door in the left-hand wall opens onto a stairwell leading to the upstairs. The service was led by two priests, and several altar servers who doubled as a choir, some of whom may have been deacons. I found it hard to keep track of just how many there were – I think about a dozen – as several went up and down the stairs, and quite a few went behind the iconostasis upon entering the church, so not all were there from the beginning. They all wore white vestments, with the priests also wearing mitre-like headwear with veils down the back. The congregation steadily grew from just under a dozen when I arrived to more like sixty by the end of the service. Many went up and down the stairs during the service, making it impossible to get an accurate count. The men sat on the left of the central aisle, and the women on the left. The men were mostly dressed in smart casual, although a few were in suits, and about half the women wore headscarves. Unsurprisingly, the congregation was mostly if not entirely Egyptian or Middle Eastern in terms of ethnic make-up. In terms of age, there were a few young children and teenagers, but most looked to be between thirty and seventy. I arrived at 9:30am (on Sunday 13 August; I published this post a day late), the scheduled time for the start of the service. When I arrived however, a service was already ongoing, although I think I had only just missed the start as there were only eight or so people there. Services in the Old Oriental Churches are very similar to those in the Orthodox Church, consisting primarily of chanted hymns, prayers and psalms, intoned Bible readings, and lots of incense and ritual. After about fifteen minutes, the initial service (which had included the reading of Matthew 28) came to an end, and many of the altar servers went upstairs. After a pause of a few minutes, one of the older altar servers, who I think may have been a deacon, handed out prayer books to the congregation. These had the Matins and the Hours in English and Arabic, complementing the screen. The Third Hour (Terce) was prayed, and then began the liturgy (communion service) proper. The service was – unsurprisingly – very similar in many aspects to that which I attended at St Mary and St Shenouda’s in Coulsdon. There was the same general division of the service into one part heavily punctuated by Bible readings (from II Corinthians, I Peter, Acts, and Luke), followed by a sermon (in Arabic, about 15 minutes long), followed by the actual communion part of the service. The giving of peace was also the same, as was the way in which communion was received (including the men going up first). Something else which was the same as at the Coptic church in Coulsdon was that the hymns, prayers and Bible readings were projected onto screens in English, Coptic and Arabic. This made it very easy to follow the service, despite the fact that it was almost all in Coptic or Arabic. The service ended at 12:30, with one of the priests casting holy water over the congregation and giving them a blessing. I should also note that there was apparently a smaller service simultaneously going on in English in a room upstairs at the same time as the liturgy. However, I chose to stay downstairs as a) that was the church’s “main service”, b) I got the impression that the English one does not happen every week and so describing it may not have been appropriate for this church’s review, and c) I was only told this by a gentleman sitting next to me a good way into the liturgy, so to have gone upstairs at that point would be to have experienced neither service in its fullness. After the service, the congregation – unlike communion, this time it was women followed by men – went up to the priest to receive warm pieces of freshly baked bread. Most then continued on to a separate part of the building, presumably for refreshments, although due to time constraints I was unfortunately unable to investigate.